Oh, the perils facing the new Chinese restaurant. 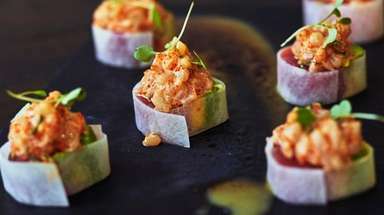 In an effort to attract customers, many restaurateurs have added sushi to the menu, others have gone a step further and rechristened their cuisine “Asian fusion” (which usually means that, in addition to sushi, you’ll find pad thai and miso cod). Owners who want to stick to Chinese must contend with two groups of diners, those anxious to engage with the regional cuisines of China, and those who prefer the comfort of the Americanized Cantonese food they grew up with. 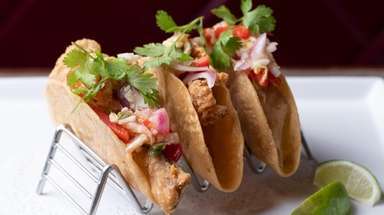 Sara Fang, the owner of Merrick Sea, is sticking to her Chinese roots, and has come up with a singular strategy that has produced a menu with little cohesion but much wonderful food. 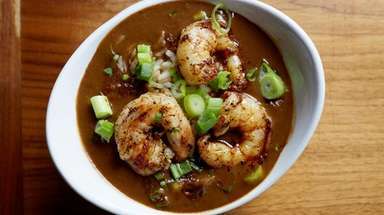 When she opened the restaurant late last year, Fang noted that there were no authentic Chinese restaurants in the vicinity, said her niece (and manager) Ivy Zhu. So she hired a chef from Flushing, known only as Mr. Wang, who specialized in the spicy cuisines of Sichuan and Hunan. 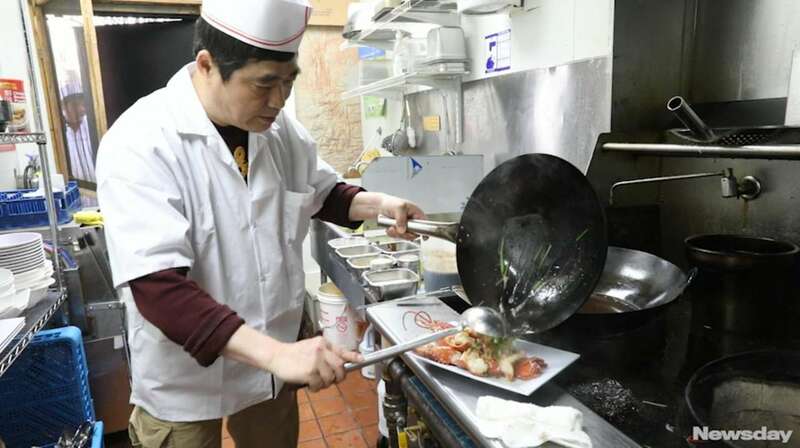 Fang also had a lobster connection: A relative is a Maine wholesaler who supplies many of the Chinese restaurants in Flushing. The restaurant’s opening bid was lobster and Sichuan. Merrick, however, countered with repeated requests for wonton soup and sesame chicken. And so Chinese American got added to the menu. The spare décor has barely changed since the space was Sogo Sushi Asian Bistro, but now the taupe walls are adorned with fishing nets that ensnare plastic lobsters, plaster starfish and a few real scallop shells. Just inside the threshold is a lobster tank whose denizens star in close to a dozen dishes. Lobster stir-fried with ginger and scallions is surely one of the greatest things to come out of the Cantonese immigration to America, the rare preparation that actually improves upon a plain, steamed lobster (which you can also get at Merrick Sea). The meat is still inside the shell, but the lobster is cut up so that it is easily accessible. If you prefer not to report directly to the lobster portion of the menu, start your meal with the pork pot stickers, plump dumplings that are first steamed tender and then seared, hard, to produce one crusty facet. Bowing to current trends, Merrick Sea serves soup dumplings that will satisfy a jones for xiao long bao (as they are known in their native Shanghai) but which I suspect are frozen. 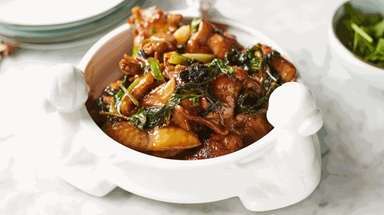 To get into the Sichuan swing of things, try the offally good beef and ox tripe, slices of beef tendon and honeycomb tripe in an oil-based sauce whose abundance of chilies is exceeded by the profusion of minced garlic. The sauce for dan dan noodles rocked — a diabolical blend of minced pork, pickled mustard greens, hot chilies and mouth-numbing Sichuan peppercorns — but the noodles themselves were overcooked and flat (like fettuccine) instead of the more traditional round. If you’re going the spicy-starter route, be sure to also order the refreshing cucumber salad, which isn’t spicy at all, just snapping-crisp segments of cucumber tossed with sesame oil and showered with more seeds than half a dozen bagels. 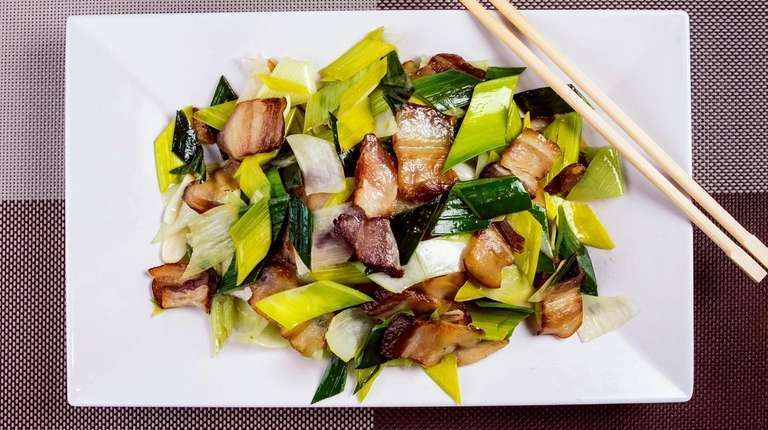 Our favorite non-lobster entree was Hunan smoked pork with garlic stems, which turned out to be very smoky slices of pork belly (sliced so thin that the ribbons of fat didn’t dominate) and overwhelmed (in a good way) with slices of bright green leek. Among the Sichuan dishes, don’t miss the ma po tofu, one of the region’s most famous. This spicy — but not crazy spicy — dish features cubes of soft, silken tofu bobbing in a sauce of fermented beans, hot chilies, Sichuan peppercorns and green garlic stems. 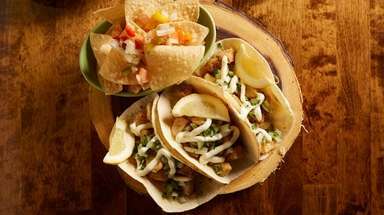 It’s listed under vegetables, but vegetarians, take heed: It includes minced beef. Vegetarians will be very happy with the selection of vegetables here, among them snow pea leaves, spinach, baby bok choy, Chinese and American broccoli, eggplant and string beans. The latter two come together in a startlingly colorful dish, glistening emeralds and amethysts. After a couple of visits I’ve only scratched the surface of Merrick Sea’s menus, which also feature plenty of Chinese-American standards, from General Tso’s chicken to crispy orange beef. But I’ll be returning for the tea-smoked duck, beef and pickled cabbage, braised whole fish in black bean sauce, hot and sour shredded potato. And more of that ginger-scallion lobster.